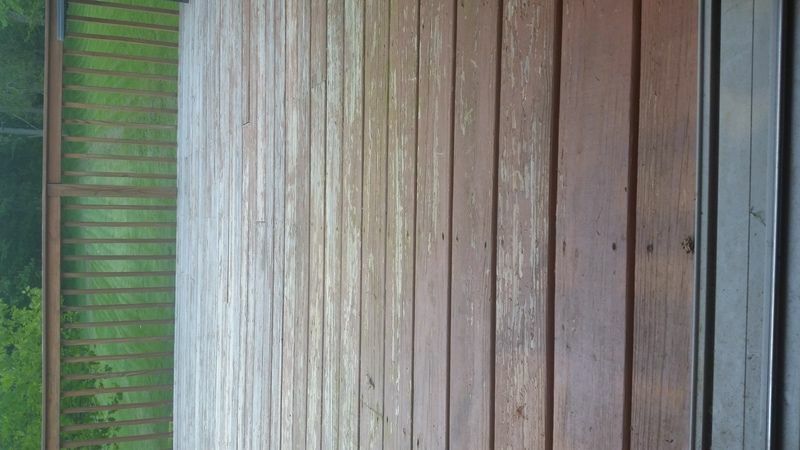 Grayed deck was not cleaned with a wood deck cleaner prior to application of finish. The use of a quality deck cleaner will not only remove all the dirt, grime, and graying but it will make the prepping process much easier. Never use household bleach or chlorine based deck cleaners. This will damage the cellular structure. Old failed coatings were not removed with a deck stain stripper. You should not apply a new coating over top of an old coating that has failed by peeling or wearing unevenly. This will prevent you new coating from performing properly as it will be subjective to the continual failure of the old stain. The use of a wood brightener was not used after a deck cleaner or stain stripper. It is very important to use a brightener to neutralize the caustics of a cleaner or stripper. Failure to use a deck brightener will leave the wood in a high pH state. Decking stains will fail faster if the wood has a high pH balance. Applying a water-based stain over top of an oil-based stain or vice versa. Many stains will not adhere to different brands or types of stains. If switching a brand or type of stain it is best to remove the previous coating as much as possible. This will give your new coating the ability to adhere and penetrate into the cellular structure. Sanding the deck to a super smooth surface such as a hardwood floor causes penetration issues. Wood decks are not the same as interior wood. The more porous the wood is the better the stain can attach to the interior of the wood. If you sand we strongly suggest that you sand with paper of 60 grit or less. In addition, it would be best to use a deck cleaner and brightener to remove the sand dust when done. Never apply a polyurethane or varnish type coating to horizontal wood. It will peel, turn yellow, and will require heavy sanding to fix. Exotic hardwoods such as IPE require coatings that are able to penetrate into their very dense cellular structure. Make sure to buy a brand of stain that is specifically designed for these wood types. Just because a deck is new and free of dirt and old coatings does not mean it is ready to be stained. All new decking should be prepped to remove the mill glaze. This allows the stain to penetrate. This can be accomplished with a deck cleaner and deck brightener. Very common mistake here. Homeowners believe that if they apply another coating or two that the stains performance will increase. It is actually the exact opposite or less is better. In general, you want to apply as much stain as the deck allows to absorb into the wood. Coatings that are over applied will film "on top" of the surface instead of "in" the surface. Film forming coatings are much more prone to peeling and wearing. There are many deck stains available today but one thing is certain, they are not all created equal. Do some research online for deck stain and reviews. You will find that many of the different stains brands have a history of failure and poor performance. Do not believe ridiculous deck warranties either. The best deck stains are typically not bought at your local Big Box store but rather online or at your higher end specialty stores and lumber yards. Penetrating stains will always outperform stains that dry or "film" on top of the wood. In general, the better the deck finish penetrates, the better the performance. Many stains claim to penetrate when they actually do not, Be wary of water-based semi-transparent acrylic wood stains such as Behr and Sherwin Williams. They claim to penetrate when in actuality they are thin versions of paint. The better you prep the deck, the better a stain will perform. Do not skip steps and strongly consider stripping off old coatings first prior to reapplication. Read all manufacturer's application directions. Research the brands of stains thoroughly. Choose a deck finish that allows ease of reapplication in the future. All stains fail eventually and choosing a coating that requires minimal prepping for reapplication makes future maintenance much easier! If you have any questions about your deck project please ask below in our comment section. I have a brand new deck (treated wood), installed May 2018 and allowed to dry out for 11 months. Unfortunately, I hired a deck sealing/staining contractor who absolutely wrecked the deck by improper preparation and staining methods. (For what its worth, he "cleaned" the deck with a power-sprayer and then returned in less than 24 hours to stain/seal - wood could not have been dry enough - then he sprayed the deck twice with very uneven application and came back to "touch up" thinly sprayed areas...creating more problems). This was done last week and the stain/sealer is already peeling in some places. The contractor used Behr Premium Transparent Waterproofing Wood Finish tinted for a "Chocolate" color. We have had another reputable company come out to advise us as to a solution and he said he would have to: lightly powerwash, heavy sanding, apply a semi-transparent oil based stain once deck demonstrated below proper moisture level for product used (moisture meter to be used). Is this the appropriate/best method to solve our problem? Any advice? If you remove all the previous coatings, then yes. Yes. If you do not remove, the new coating will fail. How long after finishing the brightener step do I have to wait before I start staining? Depends on the brand of stain you are using but typically a couple of days. I am very frustrated. 4 years ago I completely sanded off all previous stain off of my 20 year old deck. I prepped accordingly (cleaner, brightner), waited the allotted time to dry and applied Defy Extreme stain. I reapplied two years later, going through same process. Well, now the whole deck does not repel water, gets dirty quickly and this winter, after the snow melted, the stain just flaked away. Ugh. I’m beginning to think Defy Extreme is not really meant for EXTREME temperatures in Minnesota! Hello, it is normal to have to redo the deck every 2 years when using the Defy Extreme. Why doesn’t the stained deck repel or bead up water? It just soaks in, thus creating a dirty, mildewy look. Also, made mistake, we redid the deck last year, not two years ago. If I wanted to use another stain, do I need to completely remove the Defy Extreme stain first? It is not designed to bead water but shed water. Beading water is bad for wood as it 100% seals it. This creates issues with internal dry rot. It should not be dirty when you apply. That would mean the prep was not fully done. If you want to switch brands, you will need to strip it off. For the last 10 years, trying to stay consistent, I have been using Thompson Natural Waterproofing/stain, reapplying every 2 years. I generally prepare by stripping, cleaning and power washing. This year the entire deck has peeled and faded almost completely. Considering a new product, any recommendations? What is the best brand of deck stain to use?? No the behr needs to be removed and switch to a better brand.All of their products are poor quality. I preparing to re-stain my deck. It is not in terrible shape but was last coated with behr semi-stransparent redwood. It is peeling in a few places, possibly due to preparation issues. You posted an article on maintaining the deck by cleaning and re-staining annually or semi annually. Does this apply to the behr product? I always thought it had to be completely stripped to allow the new product to penetrate. Also, I have seen some pretty bad reviews on the Behr stripping and cleaning products as well as the stain. What are the main short-comings of these products? Thans. Tery, it should not as the kit does not contain bleach. If I use the Restore a Deck kit, will it bleach out the stain I used (Olympic Maximum Stain & Sealer in One)?? I spent many, many hours staining the underside of the deck and am afraid it will streak the underside as it drips through the deck boards. We have a sitting area under the deck so it is very visible.Thanks!! Carla, you cannot fix by adding more product on top of the paint. You would need to sand off all the old paint first. Hi the deck is approx. 12 yrs old, I would need a name of a company that carries a finish that will penetrate well. I have been painting the deck every two yrs. Stripping will not remove a solid color stain. Sorry but you will have to sand. We did everything wrong staining our deck, now we have a peeling mess. I pressure washed it 3 times being careful not to damage the wood. I still have over 50% of continuously peeling stain. I thought about using a stripper, but I am concerned about damaging our air conditioner, pool filter and pump and also the pool which is partially under the deck. For many years we have used oil based stains, but our local big box store told us they only had water based now. It had been 4 years since the last staining so we thought it should be okay to switch. We used Cabot solid color water based stain (2 coats) over 2 years. Can you suggest the products I could use. I would prefer not to have to sand 725 sq.ft. of deck. Elmer, all of the old stain by sanding. Clean and brighten after for prep. Best to use the same type (oil or water based) of solid stain that was used before. Two years ago we had a new cedar deck built around our above ground pool. We used a solid stain that we bought from Sherwin Williams (not sure of the brand). It started peeling mostly in the traffic areas. We pressure washed it and got most of the old stain off. Now we want to re-stain it. Would we be better to use an oil based transparent stain this time? Would it cover over the areas that we were unable to get the old stain off (mostly on knots)? 1. Strip what you can.